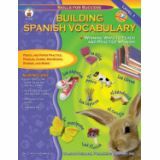 Support foreign language acquisition with Skills for Success: Building Spanish Vocabulary for students in all grades. This 128-page resource book is designed to help introduce Spanish in your classroom, while emphasizing vocabulary development. It helps students practice beginning Spanish vocabulary and build awareness of Hispanic culture. Key Education's Survival Signs and Symbols Learning Cards are a must-have for any early learning or life skills class. 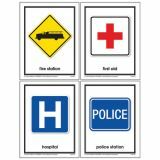 This set of 48 learning cards feature essential indoor and outdoor survival signs and symbols for the home, school and in the community. Recognizing and understanding these signs will help keep students safe and encourage independence. Wonderfully illustrated and easy to understand definitions make these ideal for students of all ability levels.Key Education has long been a trusted provider of resources to enrich the lives of young and special learners and Key Education learning cards are the perfect tool to teach essential social skills and safe behaviors.